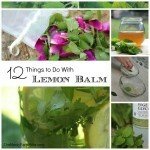 Last week, I shared 12 ways to use up an abundance of Lemon Balm. Today, I’m going to highlight its equally prolific cousin: Mint. Though it attracts beneficial insects and has many practical uses for home and health, mint can quickly become unruly in the garden. Be sure to plant it in an out of the way spot or a container to help keep it reigned in a bit. Besides common peppermint or spearmint, you should be able to use: orange mint, apple mint, chocolate mint, pineapple mint, and lemon mint in the recipes as well; keeping in mind that the flavors/scents will be affected to varying degrees. For the projects listed in this article, we’ll need to gather and dry some mint leaves, then infuse them in oil. If you don’t have any available, you can order dried peppermint & spearmint through Mountain Rose Herbs or Bulk Herb Store. Another place to look is your local grocery store. Our area Walmart carries a small selection of fresh herbs, including peppermint, in the produce section for only a few dollars. Gather up some leaves from your plant, then gently spread them out in a single layer on a paper towel and let them air dry where no one will disturb them for a few days. Let these dry until they feel fairly crispy. The leaves should still have a strong minty smell when you crumble one between your fingers. Take a large mason jar (or other heat proof glass container) and pour a few inches of a light oil into the bottom then start crumbling mint leaves into it. Swirl or stir this so that the leaves are covered, then repeat layering oil and adding leaves as needed. You can aim for a ratio of around 1/3 leaves to 2/3 oil, but I really just wing it each batch, so don’t get hung up on numbers. The reason I layer this way is to make sure that all of that good mint scent is caught in the carrier oil and doesn’t have a chance to escape. For type of oil: I prefer sunflower oil, but you can also use: Sweet Almond Oil, Jojoba, Apricot Kernel Oil, light Olive Oil and so forth; keeping in mind that you don’t want a strongly scented oil to compete with the smell of mint. If you’re in a super hurry, you can also set the jar of oil down into a pan containing a few inches of water. Set the pan over medium lowish heat for a few hours and let the warm water speed up the infusing process. Keep an eye on this and check water level and condition of oil frequently, adjusting burner temperature as needed. I position a canning lid, lightly on top of the jar while it heats – to keep the vapors in – but I don’t put the outer ring on or create a tight seal until it has cooled. Let the jar have a way to “breathe” a bit. Once your oil has sufficiently infused, it should have a nice, light minty smell when you open the top. Strain out the mint leaves and then your oil is ready for use! Today, I’ll share three recipes, but there are plenty of other uses for this oil. 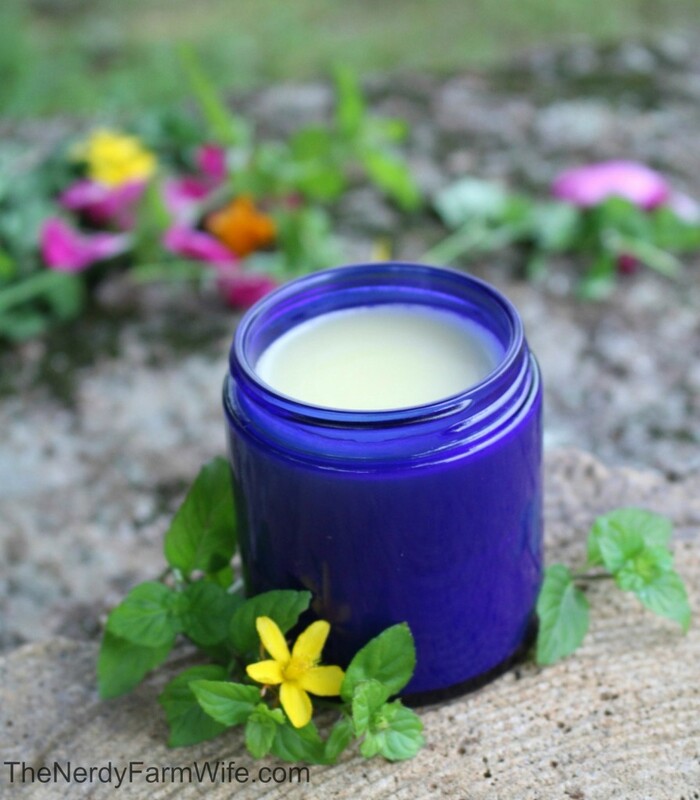 Besides making lip balms and salves, you can also use it to make soaps, lotions, creams, body/foot scrubs or as a refreshing massage oil for achy muscles. 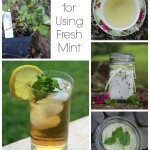 You don’t have to use just spearmint for this; use any type of mint you have on hand. Since the oil already has a light scent, you may not want to add any essential oils. The castor oil lends unparallelled gloss and smoothness, but if you don’t want to use it – substitute more mint infused oil instead. Place the oils, wax & butter in a heat proof jar or pyrex measuring cup. Set it down into a pan filled with a few inches of water. Set the pan on your oven burner & bring the water to just under a simmer, over medium-low heat. Heat until the wax and butter are melted, then turn off the burner and remove from heat. Add essential oil, if using, and then carefully pour into containers while still hot. 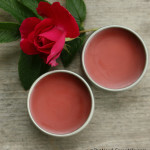 This recipe fills around 8 or 9 lip balm tubes or 3 to 4 small, half ounce tins. 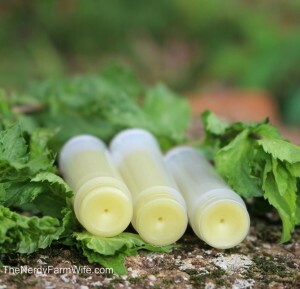 This lip balm is made almost exactly like the recipe above, the only difference being the addition of chocolate and peppermint essential oil. Follow all of the steps for Spearmint Lip Balm, only add a tiny corner of a square of unsweetened baking chocolate or a pinch of unsweetened cocoa powder to the other ingredients before heating. Stir occasionally as everything melts to see if the level of cocoa needs adjusting. Keep in mind that it will look much lighter when it cools and sets up. The lip balm pictured here was a rich, dark chocolate color when I first poured it into tins. Add around ten to 15 drops of peppermint essential oil, if you wish, then pour into tubes or tins. 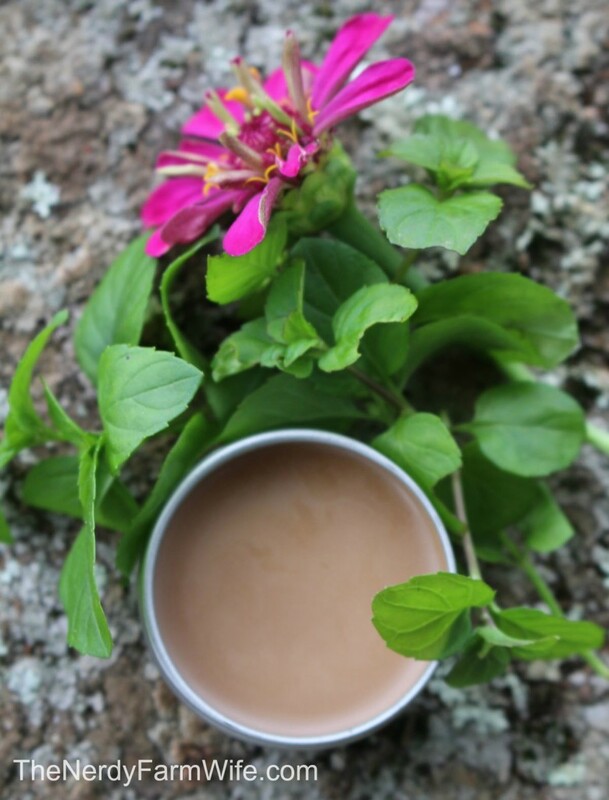 Peppermint is a classic revitalizer and pick-me-up, so this salve is perfect for sore, tired feet or aching muscles. It also has a mild analgesic effect which makes it great for rubbing on your temples when you have a headache. Add the oil and beeswax into a heat proof jar or glass measuring cup. Set it gently into a pan containing several inches of water, creating a makeshift double boiler. Gently bring the temperature up to medium-low and let the container stay in the heated water until the was has melted. Turn off the burner and remove from heat. Add peppermint essential oil, if using, then pour into containers. Fills one 4 ounce glass jar (as shown) or two 2 ounce tins. I buy jars and tins from Specialty Bottle or Mountain Rose Herbs. If you enjoyed this project, let’s keep in touch! Be sure to subscribe to my monthly newsletter so you won’t miss a thing! 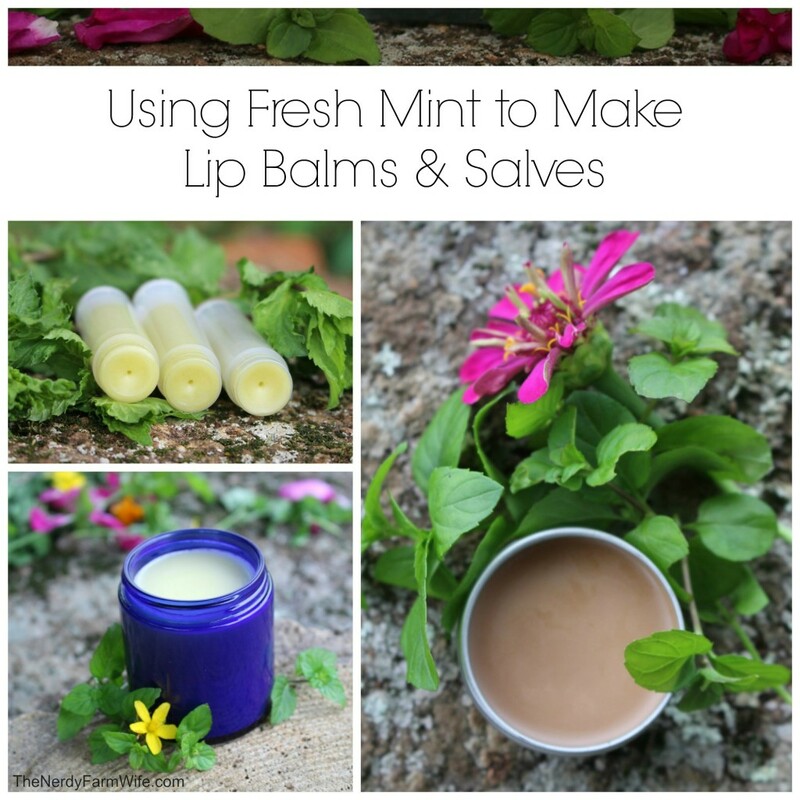 Tagged fresh mint, lip balms, mint, Salves. Bookmark the permalink. Have you ever used coconut oil for it? I only really use that and shea butter for my body. I’m thinking if I do the ‘quick’ method then I’ll be able to keep the oil in a liquid state, and then use it as a salve when it’s hardened. Any thoughts? Your mint products sounds lovely. We too have a great abundance of mint. I have been drying a lot and have lately put some in a batch of soap but it is fun to think about other uses. Your recipes sound wonderful, thanks for sharing! I often put a little honey in my lip balm recipes and infuse the honey with the mint too for extra flavor and oomph. When you are letting the oil infuse, do you put it in a sunny spot? I think I have read that in other tutorials. Or is the sunlight bad for it? I made your peppermint lip balm recipe and I added chocolate. I blogged about your website in my blog. Thanks for your recipes. Where do I find the containers to make the lip balm? Can you use vanilla or a berry flavor? how would you go about it in regurads to this recipe? Hi-I followed the recipe for the mint chocolate lip balm but it did not set. What did I do wrong? and just a small bit of cocoa powder or teeny tiny corner of a bar of unsweetened chocolate. You can remelt what didn’t set up and then add a bit more beeswax. Before you pour it all back in the tins/tubes, then dip a cold spoon in the mixture, let it set up a minute and test it on your lips. Then you can decide if you need even more beeswax. I hope that helps! Hi, I was wondering if you knew what the shelf life was for the salve and lip balm. I have never made it before and was thinking about trying for Xmas gifts. Hi Katelyn! The shelf life is usually six months to a year, depending on the quality/age of the oils you start with. Something I’ve found out is that if I make gifts too far ahead, the essential oil scent fades a bit more than I’d like. For that reason, I just make the oil and store it until November or early December, then make the items I want to give, making sure I put in plenty of essential oil, so it will smell great at Christmas. your spearmint lip balm is great! how did you get the great light green colour? Could I use a clay? i’m new here and just started making my own lip balms. i’d love your advice on a vanilla mint recipe. i think you’re site is just absolutely inspiring! i’m a nurse who’s begun looking to a more natural way of caring for myself and my family. it’s been shocking just how easy that can be. thank you for EVERYTHING you have here!! Hi Maureen, I’m happy you like the site – thank you! :) To make a vanilla mint lip balm, you could just add a few drops of vanilla absolute along with the peppermint essential oil. I buy it from MountainRoseHerbs.com. I’ve also seen a natural vanilla oil that I’d love to try from here: https://www.thesage.com/catalog/products/Natural-Vanilla-Oil.html You just want to make sure anything you use is oil based, since regular vanilla extract (like for cooking), is water based and will separate out of your lip balm. Just wanted to tell you I Iove your site. Your site is very informative and goes only with my philosophy of natural products. I am making a lip balm with a few changes. Thanks for the inspiration. Will let you know how it turns out. I am wondering if I could use a dehydrator to dry the leaves. It is pretty humid here in Arkansas and sometimes it takes forever to dry anything. I had Passion Flower vines hanging in my bathroom (an unused bathroom so no problem from steam) for what seemed like forever and ended up putting it all in the dehydrator. Hi Becky, It sounds like a dehydrator is the best bet for your humid climate! Hi! I absolutely love your ideas! I am new to all of this and am wondering if I can infuse my spearmint oil with wilted leaves or if dry is better? Hi Aline! I usually like to make sure my leaves are completely dry, but if they’re wilted and *almost* dry, they will probably be fine too, especially if you infuse them via the hot method. I hope you have fun making things with your mint! Does the fast or slow method work better? All the other comments make it sound like mint is just everywhere and we have to find uses for it so it doesn’t take over the world but I only have one potted mint plant and I don’t know much about plants so I was wondering if you knew how many leaves I can pick off of it before I kill it? Is it fine if I just leave all the baby leaves? I’m not really sure, but I’d think you could probably pick a few leaves off of your baby plant, here and there. I’d leave more than half of them attached though. You can often find mint in the produce section of your grocery store too, if you want to use that while you wait for your plant to grow bigger. Hi there! I’m stumped! I tried to make quick oil infusion’s (warm crock pot overnight)using dried mint and patchouli, each in a good olive oil, and pint jar, but there’s absolutely no smell! My lavender and eucalyptus turned out wonderful! Any suggestions? Hi Theresa! Mint is very subtle and volatile. I start with whole dried leaves and crumble them up right as I’m ready to add the oil in order to best capture the scent. Even then, you might need a double infusion. 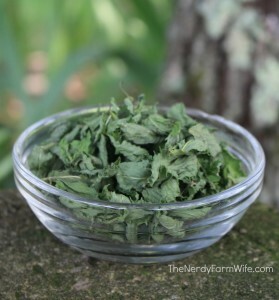 Were your dried mint leaves fairly new/fresh and still green? They’ll lose potency over time during storage & color can be a good indicator. I haven’t tried a patchouli infusion before – I wonder if it’s another finicky one? I’m glad your lavender turned out well though and a eucalyptus infusion sounds wonderful too! I have tried a few ways to infuse oils, including air drying and adding the leaves to the oils. These are resting in the basement now for a couple of weeks, with almost no scent. I also tried adding the dried leaves to the oil and letting it simmer for a few hours in a few inches of water covering most of the jar. I also tried this with non dried leaves. The only thing that seems have worked is lavender. Everything else smells like organic plant water, even though the mint and lemon balm smelled incredible going in. What am I doing wrong? I’d love to capture the beautiful lemony scent of the lemon balm, but it just smells like plants:( Any tips would be great! Thank you. hi my name is mitchell and I was wondering if its dangerous to mix and match infused oils I have chickweed, arnica, borage, German chamomile and so fourth and I wanted to make some salves but I wasn’t sure if I could mix borage with chickweed I have done some research but no one really has a good answer. Thank you so much, Jan. 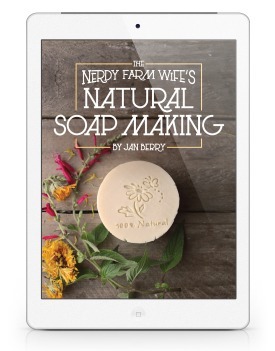 I was also wondering if you had any medicinal plants that you recommend getting.I also made some of your mint lotion. I was wondering if you know a way to keep it fresher and longer then a couple of weeks? Leucidal Liquid SF is my favorite right now and you only need a small amount to make it last. If you don’t have access to those, you can keep the lotion in the refrigerator, but it still needs to be used up in a few weeks or it will probably start to mold on you. Thanks Jan that help a lot. I was also wondering if you had and any medicinal plants I should get our think about getting. I’m fourteen and like growing plants and making stuff and learning. so any tips you could give me would be great. 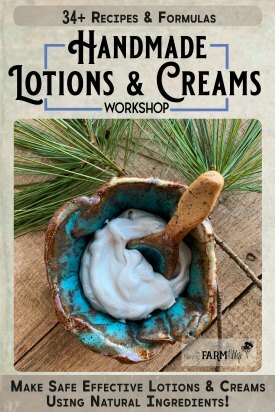 I’ve used you recipes and their great but I would like more info on any tips on growing and making salves, lotion and stuff. That’s wonderful that you have such interests at 14! You’ll be a self-taught expert years before most, which is very cool. Calendula is a fun plant to grow and has lots of uses, if you haven’t tried that one yet. Another one I REALLY like is spilanthes – also called a toothache plant. It has an interesting effect if you chew a bit on the flowers or leaves – it turns your mouth numb, much like Novocain at the dentist would. It’s really good for toothaches, but also exceptional for stomach bugs. It’s one of my plants that I’d never want to be without! Lemon balm grows easily and the plants are usually easy to find at garden centers in spring and there’s lots you can do with it. I see you already found the mint information – that’s another great one. Let me know if you have any more questions and good luck with your growing and herbal adventures! I just purchased your book. I can’t wait to get it and try all of your great recipes. If I make the infused oil in July, will it keep until November? 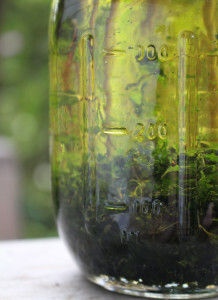 Do you need to worry about the canning seal for the slow method of infusing mint oil? My jars don’t appear to be sealed and I’m new to canning…should I try to heat them or will they seal at room temperature? So excited to try this- thank you for sharing the recipe! Hi, thank you so much for this guide on infusing mint oil. I have a ton of spearmint in the garden and no idea what to do with it. This is perfect. I do have a question – (1) What’s the reason for drying leaves for few days before adding them to oil? Why not use them fresh the same day after air drying?